イベントのお知らせ - the upcoming events at daredemoyoga! It's been much too long since I wrote my last blog. Well, I'd never been a proficient writer to begin with and my blog entries were somehow sporadic. Still, loads of people have commented on my lack of, eh, effort and asked me when I'd update it. 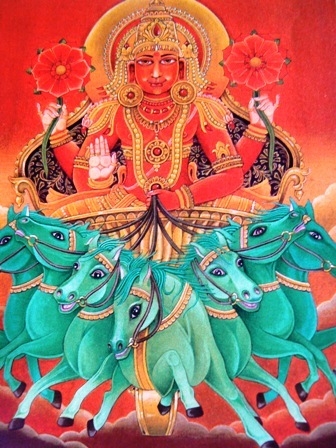 ***"Make a Wish 108 Surya Namskar"
Yes! We are doing another grueling yet feel GREAT event on Sunday, 12th December at daredemoyoga. Just like the previous events, we will do 4 rounds of 27 Sun Salutes together. We'll burn the bad karma of the past year and purify our mind and body to prepare for the New Year afresh. Also, we'll plant a seed of intention (sankalpa) in our mind so that whatever our intention might be, it will root down, sprout, grow and flower in the coming year! This event will be held on Sunday, 12th December 2010 at 10:00am at daredemoyoga. The event is expected to conclude around 13:00pm. Among our 5 senses, "sight" has the strongest impact on our awareness. During yoga class, we often hear instructions such as "turn our awareness within". As you know, yoga is to turn our mind eyes inwards to find a place of stillness within us. Most of us, however, find it pretty hard to actually do so. Whatever enters in our line of vision, our awareness scatters towards that direction. Well, so how about if we do yoga blindfolded? Then, our sight won't be able to distract our awareness, right? Without seeing the outside world, we can easily turn our awareness inwards. We'll feel the flow and pulse of our energy more. Also, the rest of our senses will naturally magnify. In this unique event, we'll do yoga blindfolded and, more significantly, NO instructions will be given during the whole event - just background music to accompany us! The idea is that we let our awareness and energy from deep within move our body as they wish. Not only that, be in turn with the combined energy of everyone present! We can stand, sit or lie down on a mat and do yoga asana, dance or just move our body however we like. This event will be held on Saturday, 18th December 2010 at 18:30 - 20:00pm at Workshop Space Roots. The participating fee will be 1,500 yen. Make sure to bring material for a blindfold. Please contact Workshop Space Roots for booking and further information. May happiness and peace reign in the New Year for all of us. Don’t you find that time passes more quickly when you are having fun? Anyway, to break the said routine, why don’t you participate in our workshops? 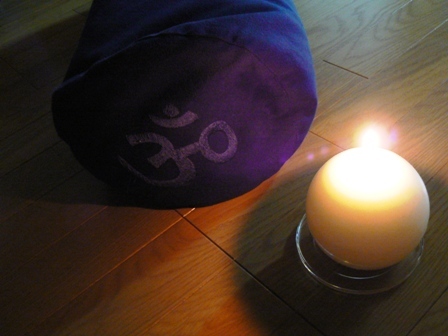 We are running the Restorative Yoga Workshop on every third Sunday of the month as last year. So far the workshops are scheduled on the following dates at 14:00pm – 16:00pm. We are also hosting a 108 Surya Namaskar Mala on 24th January 2010 at 10:00am – 12:00pm. For more information please contact daredemoyoga. You might be reflecting on the year right now just like me. Let’s hope that all our dreams and aspirations will be realised! Anyway, to make a wish for the coming year, we are hosting a 108 Surya Namaskar Mala on Sunday, 24th January 2010 at daredemoyoga. The Surya Namaskar or sun salutation is a series of yoga asanas and its practice originates from the Vedic time when the sun was worshiped for good health and prosperity. Depending on a style of yoga, there are slight variations to the numbers of asanas and asanas themselves which are performed in Surya Namaskar. Regardless of these variations, its benefits to both body and mind are profound. 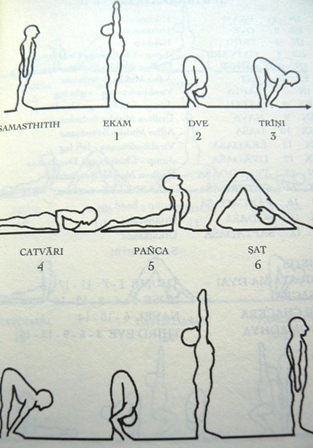 Physically, these series of asanas exercise the entire body. It promotes the breath awareness as each movement is synchronised with breath. Once the movement starts flowing, the experience turns into a moving meditation – the mind moves towards the state of eka grata (one-pointedness). Also the dynamic movement of the body and breath creates the tremendous heat (tapas) that burns the impurity of body and mind. 108 is a sacred number in <?xml:namespace prefix = st1 ns = "urn:schemas-microsoft-com:office:smarttags" />India. 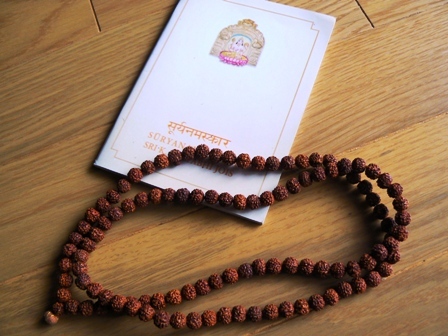 A mala (a prayer pendant) is a string containing 108 beads used for the repetition of mantra. 108 Surya Namaskar sounds daunting? We’ll do 4 sets of 27 rounds and in between the set you can meditate or just rest quietly. At the end of 108 rounds, your entire muscles might be screaming, but I guarantee that you’ll feel great! If you are interested, please email me via our website. September has gone so quickly! Anyway, I would like to make a little announcement today about upcoming Restorative Yoga Workshops at daredemo yoga. 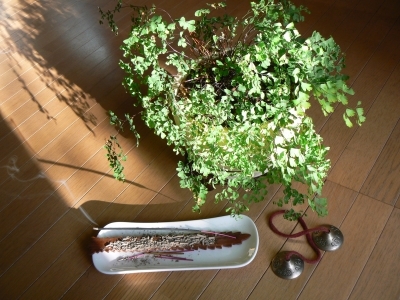 A series of workshops aimed at exploring restorative yoga are planned on the 3rd Sunday of each month starting from 18 October 2009. As I have written in my previous blog, restorative yoga is still a pretty new concept in <?xml:namespace prefix = st1 ns = "urn:schemas-microsoft-com:office:smarttags" />Japan. In recent years, the popularity of yoga has been well established here, and nowadays, many yoga classes are offered everywhere. These classes tend to focus on building flexibility and strength in the body, and this is fantastic if they are what your body and mind need. But sometimes your body and mind get depleted by accumulated stress and fatigue so that what they really need is “nurturing” – restoring equanimity to the mind and returning vitality to the body. 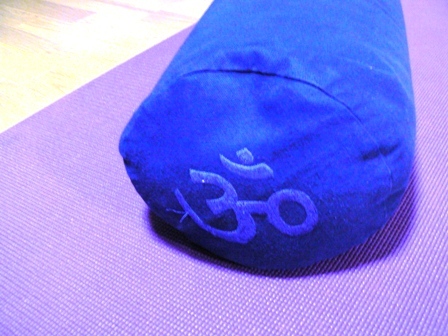 Restorative yoga does those and more. These workshops offer the participants opportunities to experience restorative yoga’s positive effects to both body and mind firsthand and to learn how to use numerous props to set up each pose. The first workshop that is to be held on Sunday, 18 October 2009 is now sold out. Two more workshops are scheduled for 2009 on the following dates. Due to the limited space and props, only 4 places available for each workshop, so if you are interested, please book early! 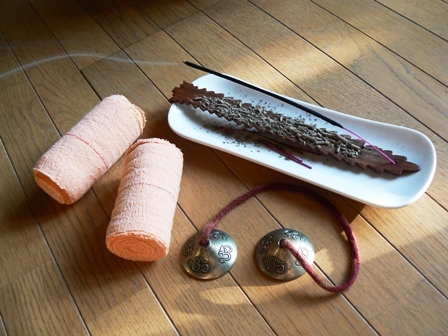 These workshops are suitable for beginners, however some experience in yoga is preferable.